Turns out, your blog becomes a party when you write 31 Days of Birthdays. The guest of honor today is my dear friend Megan, the charming writer behind the blog Fried Okra. She's sharing about a rock star birthday party she threw for her daughter, and it's, like, totally awesome. 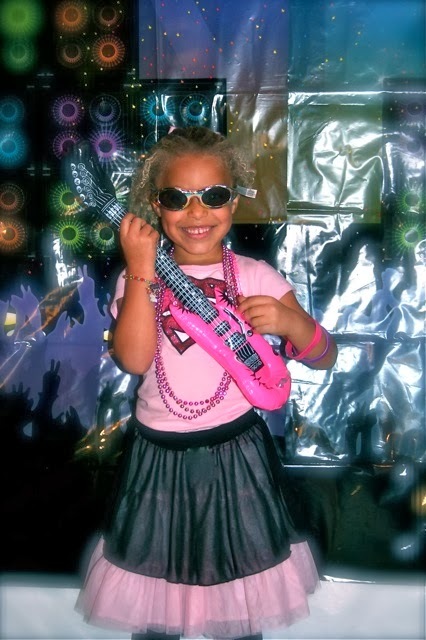 Around the time my daughter Bean turned six, she was smack dab in the middle of a full-on fascination with all things pop music and fashion and dance. Not unlike pretty much every 6 year old girl, ever. 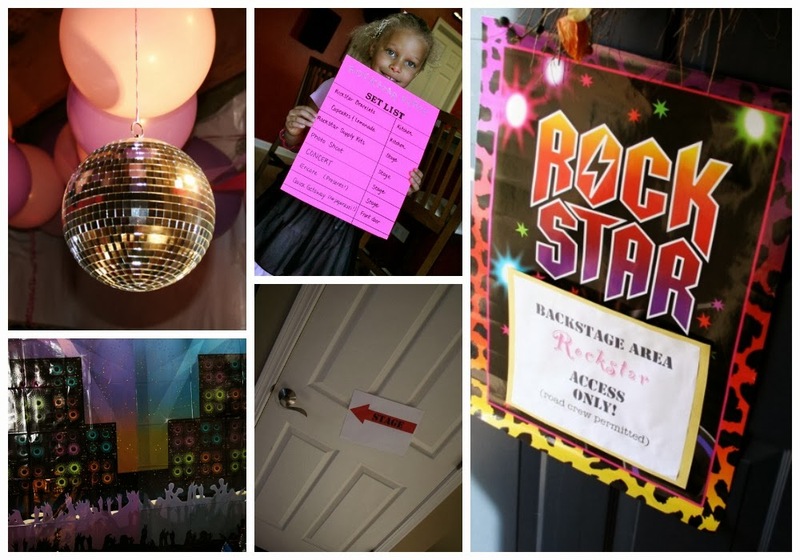 So to incorporate all her budding big-girl passions into her birthday party, we went with a Rock Star theme. My goal? 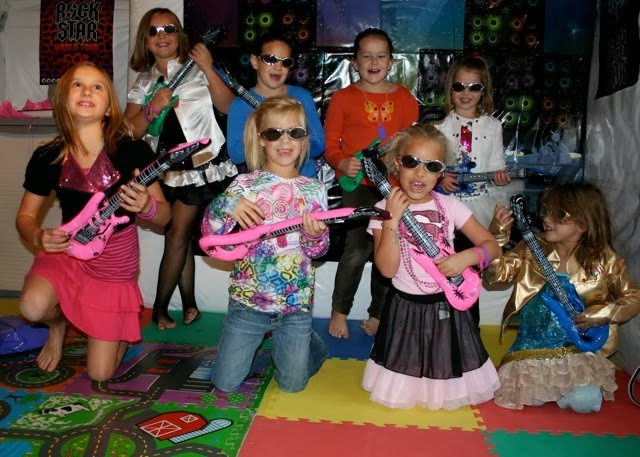 To recreate the excitement of the last few breathless moments backstage before a rock concert, and then let the girls storm the stage to sing, dance and entertain their fans in their very own basement arena. On the invitation (which was shaped like a guitar and matched the plates you'll see below), we asked all of our party-goers to dress in rock-star attire so they'd be ready to wow the audience with their own spins on celebrity fashion. This? Was a spectacle to behold, my friends. A TRUE AND DELIGHTFUL SPECTACLE. To capture that ultra-hip rock star vibe for the party, I ordered a bunch of fun, glittery, girly and music-themed stuff from Oriental Trading Company - rock star posters, inflatable "air" guitars in a variety of colors, rock star bracelets and ID tag necklaces. I also created a few fun signs and posters and a Set List (the party agenda) on my own. The stage (in the basement) featured an Oriental Trading Co. plastic backdrop featuring gigantic speakers and a throng of squealing fans, plus I encrusted the ceiling overhead with pink and purple balloons and streamers. Dad rigged up our Christmas spotlights to shine on an old disco ball I'd hung on the exposed rafters to create enough sparkles to delight even the most jaded crowd of 6 - 9 year old girls. Which is to say, a really, really lot of sparkles. I may or may not still be seeing spots, blink-blink. Do not adjust your screen, these are the actual colors of the frosting I made to decorate simple vanilla cupcakes. 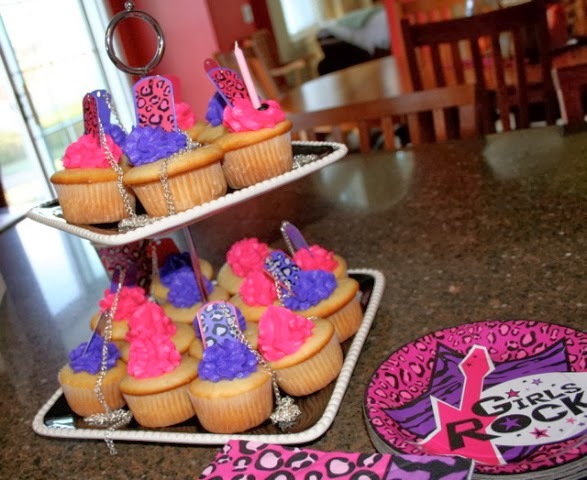 We topped each cuppycake with a rock star ID tag necklace to give 'em some extra pizzaz. Friends, you have not witnessed true joy until you've beheld the face of a 6-year-old starlet as she licks neon pink frosting off her brand new flashy leopard-print blingity-bling-bling. Back stage, we made beaded rock star bracelets with kits from Oriental Trading Co. They were adorable and a huge hit, with little musical notes and guitars and tiny disco ball beads. Little girl heaven! As the rock stars finished up their bracelets, Dad headed down to the arena to fire up the pre-selected playlist of popular but kid-friendly songs (including a certain age-old but perfectly appropriate Cyndi Lauper anthem from my own girl-hood) we'd created on his iPod and set the disco ball spinning, so that as our rock stars roared down the steps one by one (we announced their names as they descended), they'd shoot out onto a stage filled with music and lights. Totally exhilarating. Like, TOTALLY. The lead rock star takes the stage with her "air guitar." Only boy in the joint. Tough job, but somebody had to dance with all those chicks, right? Also please note, he brought a stroller to a rock concert. I guess he was hoping to bring home a babe. 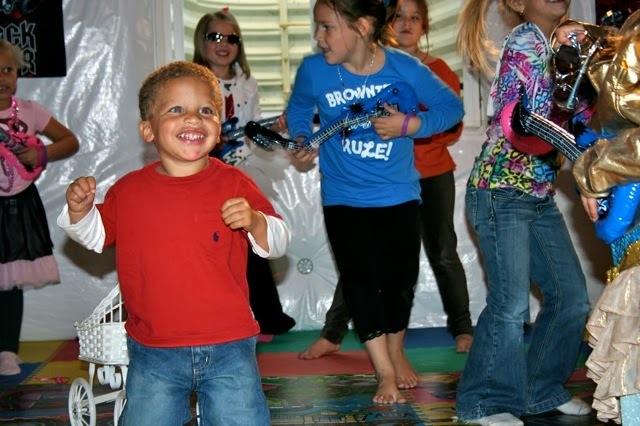 The girls sang and danced free-stye to a song or two,then we played freeze-dance and musical chairs. 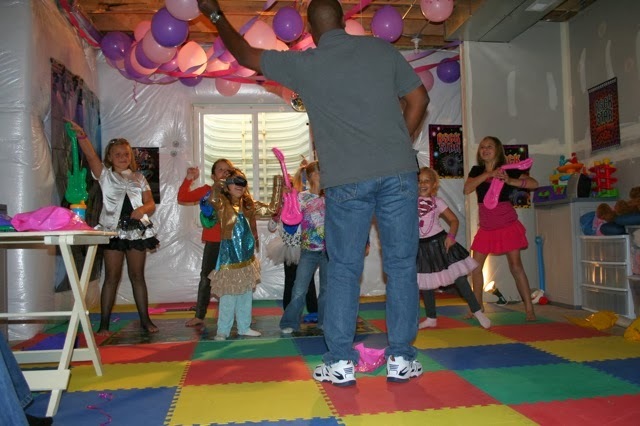 Dad even shared a few of his best moves with the rock stars in a fun dance-off. I think that turned out to be the best part of the whole party... I mean, who doesn't catch a major case of giggles over a Dad shakin' his groove thing? 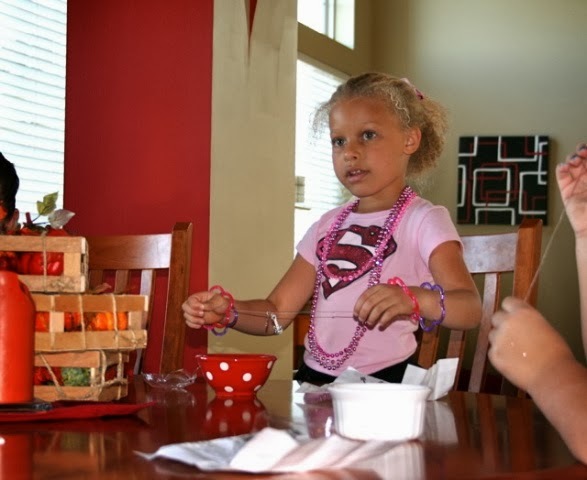 I loved this party theme because it created mega-excitement and gave us a loose framework to let our party-goers do all the things they love doing anyway. The girls all went home happy, with bracelets and necklaces and an air guitar each, and three years later, Mama still enjoys the disco ball hanging from the rafters in the basement gym and has no plans to take it down anytime soon. After all, girls just wanna have fun.